Introducing Norteño by Willy Herrera. This full-bodied maduro creation was the first cigar brand released from the Drew Estate factory after Willy Herrera was named Master Blender in June of 2014. 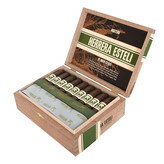 These premium hand-rolled cigars employ the finest handpicked filler tobaccos from the Estelí and Jalapa regions of Nicaragua, and are covered by a snappy Honduran binder and then cloaked with a bold Mexican San Andrés maduro wrapper. A true work of art from Mr. Herrera!